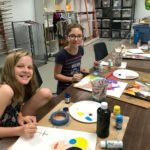 The South Bend Museum of Art provides exciting art camps through the summer to engage the young artists in our community. 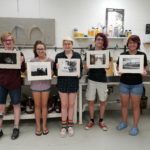 Students work with local artists and art educators to explore media, develop technical abilities in the visual arts, and pursue their own curiosity and creativity in a supportive environment. Camps are offered by age group: age 5, ages 6-8 Survey camps, ages 9-12 survey and media focused camps and Specialty Teen Camps. The museum hosts camps in their unique studio spaces, offering media exploration beyond the scope of the average art classroom. During our survey weeks, children and youth engage with a variety of media across selected themes, meet professional artists in their own communities, and explore the museum’s permanent collection to gain an understanding of what contemporary art can be. Our focus camp weeks allow students to explore a specific medium or process to achieve deeper understanding and mastery of skill. Contact Julie Farmer at farmerj@southbendart.org if you have any questions. We are working diligently to have all summer camps posted.